There are conspiracy theorists in every walk of life. There are people who will tell you that the Holocaust was an elaborately well-staged affair, likewise a select few will try to convince you that Neil Armstrong’s landing on the moon was all a pantomime. And as for 9/11? Let’s not waste our time with those who believe the incident at The Pentagon was all a massive stage show. Similar things happen in music, not to that extent I agree, but so many try and read things into songs that are just not there especially when it comes to drugs. A good example would be The Beatles’ Lucy in the Sky with Diamonds, The Shamen’s Ebeneezer Goode and The Strangers’ Golden Brown – none of the acts actually agreed they were about drugs yet they are generally accepted that they are. 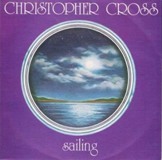 Today’s single is another, believe it or not, there are people who have taken time to contribute to forums to convince us that Christopher Cross’ 1980 hit Sailing was all about getting high. Let’s find out. Christopher Cross was born Christopher Charles Geppert in May 1951 in San Antonio Texas and as a kid he first learned to play drums and within a couple of years turned to guitar. His career began in the mid-seventies when he was lead singer with a local band called Flash and then signed a solo contract with Warner Brothers in 1978. He released his eponymous debut album the following year and the debut single, Ride like with Wind, which featured Michael McDonald on backing vocals, reached number two in the States but stalled at number 69 over here. One of the biggest films of 1981 was Arthur which starred Dudley Moore, Liza Minelli and John Gielgud and Cross was asked to provide the theme tune. He co-wrote the song with Peter Allen, Burt Bacharach and Carole Bayer Sager and the following year won an Oscar for Best Song. Cross was married to Jan Bunch in 1988 and they have two children, a son Rain and daughter Madison but they divorced in 2007. He continues to record and has released four albums in the last six years; Christmas Time Is Here (2010), Doctor Faith (2011), A Night in Paris (2013) and Secret Ladder (2014), none of which have been much of an impact on the album chart of either side of the Atlantic.